All the Summer Girls by Meg Donohue is a riveting coming-of-age tale set on the New Jersey shore. Donohue, the author of the bestselling novel How to Eat a Cupcake, is a master of literary fiction; her skill is demonstrated in this charming and moving second novel. Set among the sunsets and dunes, All the Summer Girls is the story of how three former best friends, their lives rapidly unraveling, are reunited at the beach town of their past—where the ambience of summer encourages them to explore new experiences they would never otherwise attempt. When dark secrets threaten to surface, Kate, Vanessa, and Dani begin to realize just how much their lives—and friendships—have been shaped by the choices they made one fateful summer night years ago. In the hope of finally moving forward, the women turn to one another for forgiveness—but how can they forgive each other when they can’t forgive themselves? 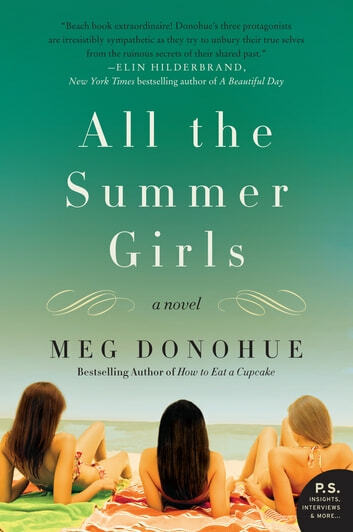 Meg Donohue is a phenomenal talent, and fans of Sarah Pekkanen, Susan Mallery, and Catherine McKenzie, will be enthralled by this rich and detailed novel about women, relationships, and forgiveness.